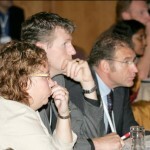 The 2009 European Users Conference has opened for registration! This year we’ll be heading to the Radisson BLU Hotel at Manchester Airport in the United Kingdom from September 20th – 22nd. There, we will share best practices, technical training, case studies and future product developments with delegates. The Conference is not only a great chance for us to meet with customers but also the perfect opportunity for our customers to meet each other and learn from other Perception Users. In 2008, we had a really diverse range of delegates from 11 different countries, and we are looking forward to seeing familiar faces as well as some new ones in 2009! All details are available on the conference website.